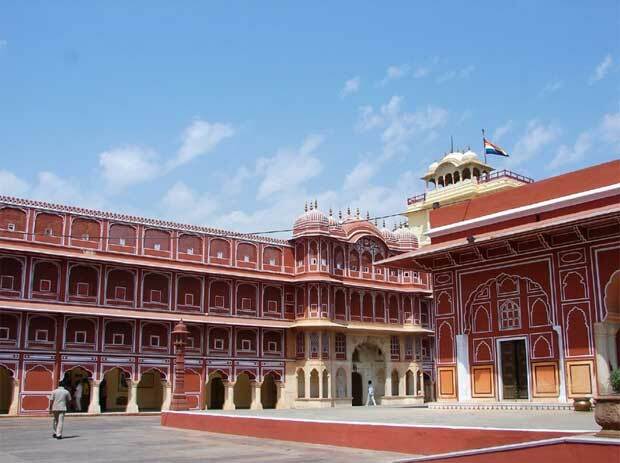 This famous Palace complex located at the center of the old Jaipur city was build by Sawai Jai Singh between the years 1729 and 1732 and subsequently other structures were added to this palace by his successors. There are two entrances to the city palace, one through Virnedra Pol and other through Udai Pol. While entering through Virendra Pol, the huge unique structure in front is the Mubarak Mahal. This building was erected to welcome the guests to Palace. Beautifully designed doubled stored building was completed by H.H Maharaja Sawai Madho Singh II. 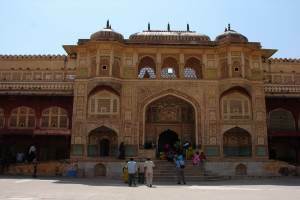 A combination of Islamic and Rajput design this building houses many precious arts, crafts and other collections of erstwhile rulers. This has one of the fine collections of arms, edged weapons and antique of the country. The edge weapons include Mughal shamshirs, curved swords, double edge cutters, daggers, axes, pointed gupties, knives, and arrows of different size and shapes. There is a sword in which Emperor Shah Jahan name is inscribed. Some swords with names of Mughal and Persian emperors. 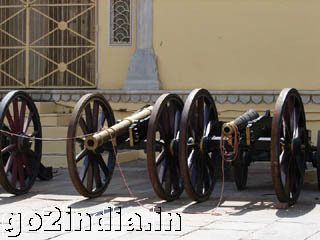 Many personal weapons of Maharaja Ram Singh II and Madho Singh II are in display. Located at the first floor of Mubarak Mahal this section have many collection of textiles used by various Kings and queens. Dresses from many different parts of India and outside used by royal families are in display here. H.H Maharaja Sawai Madho Singh I was a tall and healthy man, his large brocaded jama is one of the attractive dress displayed here. The wedding dress of Maharajas ( kings ) are some of the fine collections here. 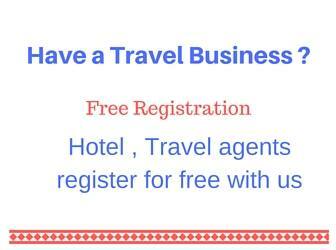 On the special occasions like Holi and Diwali kings and queens were wearing special dress. Art gallery is displayed inside Diwan-e-aam or commonly known as the hall of public audience. 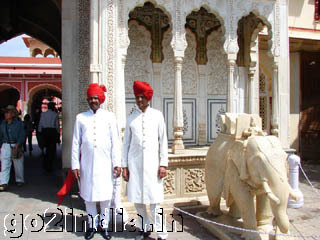 In this hall Maharaja Sawai Man Singh II took oath as the first RajPramukh of the state of Rajasthan. This ceremony was organized in the presence of Sardar Vallabh Bhai Patel on 30th April 1949. Many paintings of Jaipur school and other arts are displayed here. Life size paintings of different Maharajas are kept here. One of the finest Pashmina carpet is in display here along with a carpet from Herat. 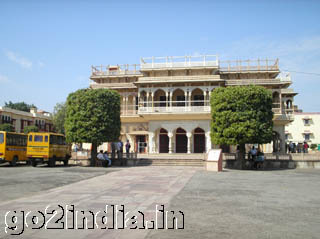 Chandra Mahal is the residence of Royal family of Jaipur. This is a seven storied building. At the top of this the flag of Kachhawaha is placed..After defeating the five Pathan chiefs beyond North � Western frontiers there flags were presented to Emperor. 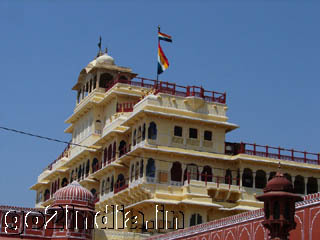 This Panchranga ( five color ) flag is created in combination of five flags and became the flag of Amber and then accepted at Jaipur once the capital is shifted from Amber to Jaipur by Sawai Jai Singh in 1727. Mughal Emperor Aurangzeb conferred the title �Sawai� to Jai Singh II. Thus one additional flag was put above the main flag to mark the title after this event. 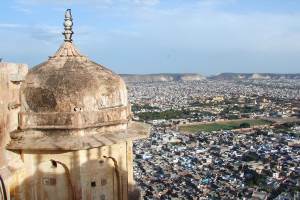 These fags can be seen inside the city palace above the Chandra Mahal. 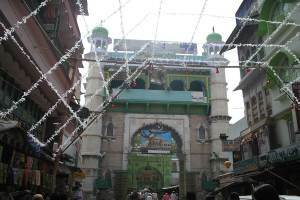 In the Diwan-e-khas there are two big silver jars are kept. These are largest silver object in the world and this is recorded in Guinness Book of World Record. These jars were made by two silversmiths ( Govind Ram and Madhav ). To construct each jar nearly 14000 silver coins were melted. Each Jar weights 345 Kg. Height is 5ft 3 inches with a circumference of 14 ft 10 inches. Maharaja Sawai Madho Singh II was only using ganga jal ( water of River Ganga ) for his daily requirements. These two Jars were used to carry Ganga water to England when Maharaja visited King Edward VII's Coronation in the year 1902. City palace has some unique collection of carriages of different kinds and they are displayed in Bagghi Khana. There are many Palanquin, Takht-e-Rawan and Mahadol in display here. 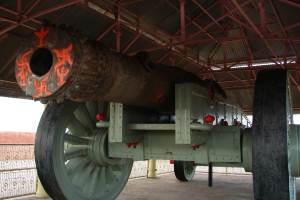 Museum is open from 9.30 AM to 5.30 PM. 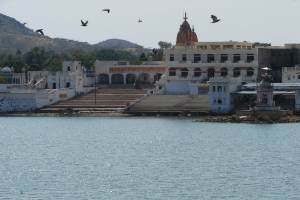 It is closed for visitors once in year just after holi. Camera is allowed inside the palace at a fee but photography is restricted inside the museums.